You might also be interested by PCH Car Sweepstakes here: Brand New Ford F-150 Platinum (Giveaway No. 6085). Wondering if you win a car, do I have to pay taxes? Get the answer about taxes here: What If I win a car, do I have to pay the Taxes? The Promotion begins September 7, 2016 at 5:00:00 pm Eastern Daylight Time (“EDT”) and ends January 3, 2017 at 5:00:00 pm EDT (“Promotion Period”) and is separated into two entry periods (each an “Entry Period”). The first Entry Period runs from September 7, 2016 at 5:00:00 pm EDT until November 1, 2016 at 4:59:59 pm EDT. The second Entry Period runs from on or around November 2, 2016 at 5:00:00 pm EDT until January 3, 2017 at 5:00:00 pm EDT. Open to legal residents of the fifty (50) United States and the District of Columbia, who are 18 years of age or older and have a valid driver’s license. Limit ten (10) Personal Page Entries per person/email address. One (1) Grand Prize winner will win one (1) $30,000 voucher to be applied towards the purchase of winner’s choice of one of the following vehicles: 2016 Ford Edge, 2016 Explorer or 2015 Edge. Approximate Retail Value of prize (“ARV”): up to $30,000.00. The Bonus Drawing winner will receive $500 awarded in the form of a check made payable to the winner. To enter, go to www.fordeventgiveaway.com website or m.fordeventgiveaway.com website for Mobile devices during the Promotion Period from your computer or mobile device fordeventsweepstakes 2017. Taxes (INCLUDING ANY INCOME TAXES) are the sole responsibility of the winner, regardless of whether prize is used in whole or in part. Sweepstakes Grand Prize and First Prize Winners will be issued an IRS 1099 form for the retail value of the prize. 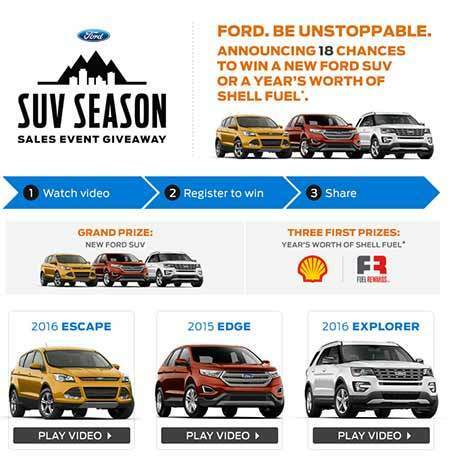 Ford Event Sweepstakes Official Rules and the Promotion are governed by US law and are subject to all applicable federal, state and local laws and regulations. I would like to win the 2017 Ford F150. I would like to win the 2017 Ford F-150. Is it the chicken dinner or rhe it the winner.hope its the winner.michael jimmy ray delao. Would love to win, win, win.I could used a new car,thank you and your team. Please get in touch with me! Yes’ I am feeling rather happy about the Brand New Car. I hope I will get it. 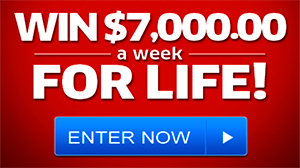 How would my life change if I was to win $10,000.00 a week for life on Dec. 30th. It would set me free. I would start living again not just existing. Get out of debt, by a new car , travel to Australia and maybe customized a ring with gem stones and diamonds. Grand Prize Bonus $55,000 Gwy. No. 4902.